This Spring, California SB (Senate Bill) 562 proposed a single-payer healthcare financing system for California. Governor Jerry Brown was immediately skeptical, stating, “This is called ignotum per ignotius….In other words, you take a problem and say, ‘I’m going to solve it by something that’s even a bigger problem,’ which makes no sense.” And in early July, California Assembly Speaker Anthony Rendon tabled the bill calling it “woefully incomplete.” While true, that incurred the predictable wrath of single payor advocates. Understandably, it’s difficult for supporters not to be enthusiastic about SB 562 given the conclusions reached by the Political Economy Research Institute (PERI) based out of the University of Massachusetts, Amherst. PERI has released a Study commissioned by the California Nurses Association (which has always favored single payor universal coverage) that projects reductions in healthcare spending by $37.5 billion a year! No small change there. 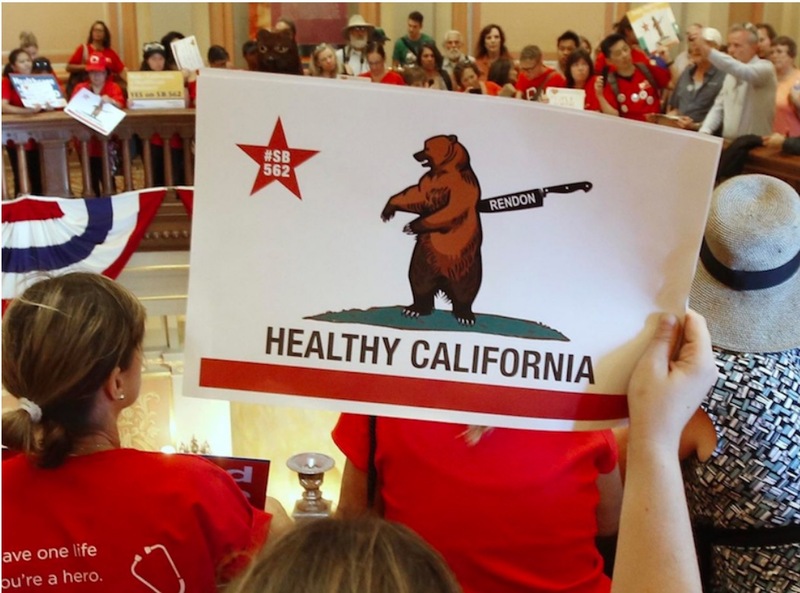 The Study reports that the proposed single payor system could provide “decent health care for all California Residents…” and while providing full universal coverage would increase overall system costs by about 10%, it “could” produce savings of about 18%. The savings supposedly will be realized through reduced administrative costs, reducing pharmaceutical reimbursement charges, and “a more rational fee structure for providers.” “More rational” usually means “reduced,” and that usually means primary care and mental health are the first in line to take it in the neck, given their limited negotiating leverage. And it gets even better. There would be no premiums, copays, or deductibles. According to the Study, people could get treated whenever and wherever they want. And money will be saved. This is like heaven. There was much missing from SB 562. For example, it did not include a funding mechanism in the Bill, leaving that to California’s Assembly. It was strong on what but light on how. That obviously troubled Speaker Rendon. The PERI Study suggested a 2.3 percentage point increase in the State sales tax which would raise California sales taxes to 9.55% not including local add-ons, and a 2.3% business gross receipts tax on revenue exceeding $2 million. The Globe went on to report that the Vermont Governor’s office estimated needed tax increases on income and payroll that more than doubled existing taxes. The Governor, who ran on this issue, pulled the plug. Not a bad point. For years, politicians advised by liberal-leaning economists have been on a rant for just this. Given the paucity of other more workable initiatives and the inability of Republicans in Congress to agree on much of anything, it may well be time to call the question once and for all. And where better than California? Of course, a universal coverage single payor system would save money right off the bat in some areas. System-wide administrative costs indeed would be reduced. Commercial insurers as we know them would be eliminated with their varied operating expenses, procedures, and the ever-present bureaucratic red tape. Employers would be relieved entirely of providing health insurance as a benefit. [Might that incent more employers to move to California?] Providers would have but one set of procedures and rules to comply with. And given that there will be no copays, copayments, or deductibles, significant administrative burdens on providers (as well as some collections problems) will be eliminated. While the savings would not constitute as big a portion of the overall coverage cost as some suggest, it represents real money in a one-time savings. However, it does nothing for the other 85% or so of the cost of coverage, namely, the claims expense. Of course, the State of California, which would be the single payor, would incur some administrative costs in running the system, processing claims, managing networks, etc. And if history is any guide, States usually are not uber efficient. But if this were to be similar to Medicare, there is almost no management of care and very little other cost-control type activity or overview. Good for reducing administrative expenses; bad for reducing claims expenses. And to the extent California engages in cost-control activities, its administrative costs would increase, but at least there would be substantial economies of scale. And those evil private insurers would (at last) be gotten rid of. However, let it be repeated: Once implemented, the administrative cost reduction would be a one-time reduction; thereafter, premium increases would resume unabated, and in fact, without cost-controls, they presumably would increase more rapidly than they have to date, unless the citizens of California undergo a huge transformation in lifestyles and how they use services. As difficult as it is to digest, the only way to truly reduce healthcare costs substantially and in increasing amounts over time is to reduce claims expense. To do that, either fees must be reduced or reductions must be had in the per person rates of usage of services. And as I have written repeatedly, the focus eventually must be on the rates of use of services by focusing on the chronically ill, and improving overall health. THAT is the way, over time, to put increasingly large bites into the cost of healthcare. SB 562 does apparently proceed down the path of reducing fees (pharma and “a more rational fee structure” whatever that might mean), but reducing pharma charges is easier said than done. Kudos, if California can do it; but it seems a far bigger problem than one that even a state as large as California can tackle alone. SB 562 (of course) does not even dip its toes into the reduction of the use of services. In fact, just the opposite given its aim of no copays or deductibles, and the ability to get care wherever Californians want without restriction. Just sayin’. If California eventually proceeds on this course, I strongly urge them to engage in massive patient education on appropriate system access and self-care. It must somehow reduce the rate of use of care to survive. What is unstated in all of this would be the future role of employers, if any, in the financing of healthcare coverage. Section 1c of the Bill states: “This act does not create any employment benefit, nor does it require, prohibit, or limit the providing of any employment benefit.” Otherwise, the Bill is silent on employer-based coverage. As I read it, employer-based coverage would disappear, and why not from the employers’ standpoint. Presumably employers would be free to offer an added level of insurance as a perk, but why would they given the open-ended access of SB 562? Indeed, some of today’s perversities in our healthcare financing system derive from the employer-based coverage anomalies. No other country is like the US in that regard. And it must be admitted that single payor universal coverage is much simpler. Like education up to certain levels, it now becomes a right funded wholly by tax dollars. Does burying its costs in our already choking level of taxes make it more palatable? We did that with Medicare and Medicaid for years. More and more commentators are edging toward varied forms of single payor or increased federal involvement. For example, Dr. Dan Stone in his July 5 post to this website proposes what appears to be a more sensible approach, albeit one that takes us further down the path of single payor. “Constructive health reform does not require more money. It does require redistributing healthcare resources away from acute and specialty care and into preventive health, chronic disease management and behavioral health services. It also demands greater transparency, lower administrative costs and balanced regulatory oversite. “The challenge is not what to do. It’s how to do it. Beyond the BCRA (Senate bill), Congress must find ways to stabilize health insurance markets, encourage innovation, incentivize health over care, increase coverage, improve access and reduce inequality? Joe Flower keeps reminding us that we are having the wrong discussion. Rather than obsessing on who pays, we must obsess on reducing how much we pay by making the systemic changes needed to reduce the need for payment. In that regard, Republican attempts to make huge cuts to Medicaid without concomitant systemic changes seems short sighted. So only partly tongue in cheek, I join in with the Wall Street Journal in inviting the great State of California, the home of so many other societal innovations, to take the plunge, adopt single payer universal coverage, and show the rest of the country how to do it. One way or the other, we will learn something, I’d hope. And isn’t that the Federalist way? Who know? Stranger things have happened, and we sure could use something like PERI forecasts. Sounds good. At the same time have Texas go total free market. No government involvement at all. See what happens. How about the free market for the reasonably healthy and the unknown sick and those that can afford their illnesses and then some safety net for the few that actually require a safety net? I have thought for a long time that we are really headed for a true two (at least) tiered system. I think the key is “those that can afford”. I think that your “few” is actually more like 50%-60% of people. I agree that the percentage of the population needing a safety net, including a subsidy, is closer to 50%-60% than a few if you include people who can’t afford their premium even if they’re healthy, people who need expensive care right now and those who have a history of a disease or condition that carries an above average risk of requiring expensive care in the future even if it’s well controlled at the moment. Such conditions include CAD, CHF, COPD, ESRD, cancer, hypertension, asthma, diabetes, depression, Alzheimer’s, dementia, among others. The unknown sick are already incorporated into the premiums so only those with long standing expensive illness end up in trouble. Healthcare costs are much higher today than need be due to government interference. Median household income in the US in 2016 was $56,000. Median insurance cost was $18,000. Average OOP is about $2000. (These are all from memory but should be close.) Can people afford 1/3 of their gross income going of premiums? Median insurance costs are sky high because of the policies we created. Look a number of years ago at how what the premiums were. They were lower and even then they were higher than need be. You are setting up a scenario to fail with numbers that are inflated due to the policies you promote. Look at how the price of Lasik has fallen while the quality has improved. Not quite right, because we get paid in healthdollars. Employers pay on average 3/4ths of that $18,000, so if employer sponsored insurance was made illegal overnight the average household income would go up $13,500, so families really pay a quarter of their gross income for their health insurance. These guys are trying to artificially alter costs so someone else is picking up the bill. None of their suggestions focus in on how to reduce the rate of growth and all they are doing is promoting wasted costs that have increased health care costs tremendously in recent years. The unknown sick were significantly incorporated into the healthcare policies at least in the past. I treated loads of patients with CAD and CHF along with COPD and the costs averaging over a period of years was no where in the vicinity it appears you think they are in and that combination is one of the more expensive groups of patients. Absolutely not. The percentage of chronically ill with very high costs is small. Those that have sudden high costs one year may not have another problem for decades. Think of how people buy homes and cars.